The IDPhoto4You web application supports most of the standard photo sizes. Choose the size that is available on your printer. In most cases the best solution is choosing the maximum available size. In this case you will get your photos for the best price. The print sizes are calculated in imperial metric system originally. So the exact sizes are in inches not in centimeters. The dimensions in centimeter are only approximate values. in countries where the SI metric system is used print sizes are in centimeter. However, these sizes are not exactly accurate. Users do not need to know these details. The printer software converts the chosen size during the printing process. The photos are created with 300 dpi resolution. Except for the Single Photo sized photos, which may be of 150, 300 or 600 dpi resolution. The resolution to be chosen, depends on the document the photo will be used for. 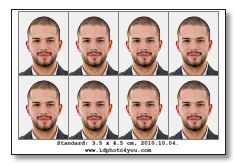 If you want use your photo for US Visa or Green Card, then you have to choose 600 dpi. If you want to create profile photo for a social networking application, then you have to choose 150 dpi. For other purposes you can use 300 dpi. Please note that you can only set the resolution on the desktop version of our website. On the mobile version the resolution should always be 300 dpi. Photo: 3.5 x 4.5 cm. Print sizes: 9x13 cm, 10x15 cm.